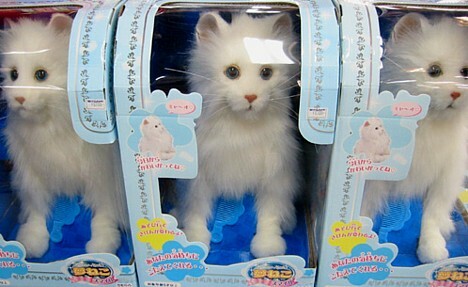 Stacks of boxed feline robots manufactured by Sega Toys, called Yume-Neko Smile ("Dream Cat Smile"), await their fate on the shelves of Tokyo toy shops. While the cats bide their time staring listlessly through the clear plastic windows of their temporary dwellings, Sega Toys steps up its efforts to find homes for them with a new TV commercial. According to the Yume-Neko Smile homepage, the cuddly robot makes a suitable alternative for anyone unable to keep a real cat. Five sensors at different locations on Yume-Neko's body allow you and the cat to engage in tactile communication. Pet Yume-Neko Smile on the head and it starts purring and flicking its tail around. Stroke its back and it starts to get sleepy. Yume-Neko also likes it when you touch its cheek, and it apparently enjoys being flipped over on its back to have its chest stroked. The cat gets mad when you touch its tail, though, so be careful! Did they sell this same cat but in more fat ? Ya. Same question as Haruhi! My 4 year old daughter has this cat. However in the US it is furreal friends. You have to pull on the cats tail pretty hard to get it to yowl. It is pretty freaky when she has it sitting in the living room and it falls asleep. Someone walks by and it jumps up and looks around. Nothing happens when you touch its tummy, but it does lay down when you pet it's back. It sheds like crazy. aspiration. » Yume-Neko Smile, the Cat Robot.